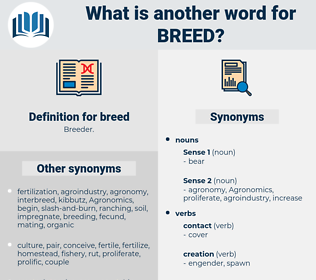 What is another word for breed? reproduced, reproduce, replicate, cultivate, nurture, produce, create, occur. herdsmen, breeder, reproducing, reproduction, half-breed, caste, nesting, nest, recurrence, race, pastoralist. spawn, engender, reoccur, re-occur, reproduction, nest. destroy, stop, not produce, ruin, refuse, halt, kill. Even the half - breed admitted that much. By the Broken Lock that freed - Man - cub, 'ware the Man - cub's breed! 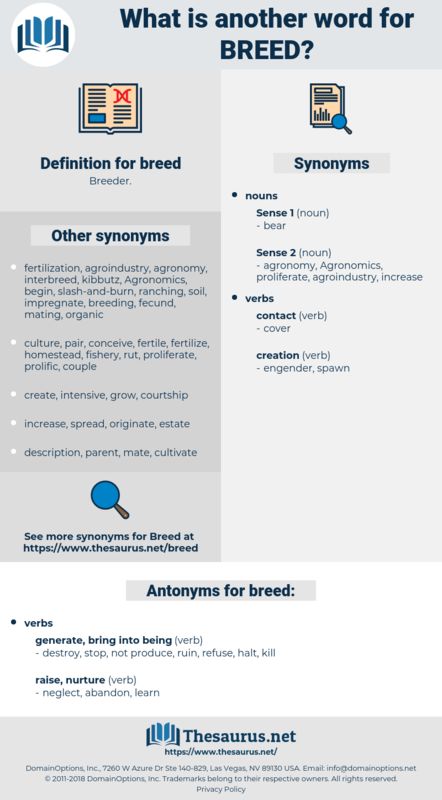 cross, interbreed, mongrelize, hybridize, hybridise, crossbreed, mongrelise. couple, pair, copulate, mate, make, create, produce.